Oak trees are popular for their great height and majestic canopies that provide ample shade, but they also possess many medicinal qualities. Oak trees are native to Europe, Asia, and Africa, and they have deep roots in English culture. They are a symbol of strength and survival, and their wood is still praised for its resilience. Different species of the Quercus genus originated in Europe, western Asia, and northern Africa, and they later evolved into different species. Today, oak is highly valued in the timber industry, and also offers nutritional and medicinal value. Treating diarrhea. Oak have been traditionally used to stop diarrhea and other infections of the gastrointestinal tract. Alleviating respiratory illnesses. The anti-inflammatory properties of oak bring relieve to the irritation and swelling in sore throats. Oak has a long history of use for respiratory conditions, such as cough and bronchitis. Relieving hemorrhoids. The oak bark also has hemostatic and anti-inflammatory actions, it can stop bleeding, disinfect, and reduce inflammation. Relieving skin inflammations. Due to its astringent, antiseptic properties, oak is effective treating eczema, acne, and itchy skin, as well as aiding recovery from mouth sores, burns, cuts, and scraps. Oak bark possesses many medicinal qualities that make it effective for treating illnesses. It is antidiarrheal, astringent, antimicrobial, and anti-inflammatory in nature. Traditionally, oak bark extract has been used to treat a number of maladies. The oak bark is comprised of 15 - 20% tannins, which have not only astringent, but also antioxidant properties. They can inhibit the growth of fungi, yeasts, bacteria, and viruses. Tannins are also able to stop bleeding by speeding up blood clotting, as well as to reduce blood pressure and cholesterol levels. Antiseptic and astringent properties can also be found in trees like acacia and aspen. Oak is considered generally safe for medicinal uses and no side effects have been reported. Oak should not be applied directly in the eyes since it can cause irritation. Likewise, it is contraindicated when there is extensive skin damage, acute skin diseases, high fever and serious infectious diseases. Additionally, oak topical use or oral consumption should be avoided in people who suffer from cardiac insufficiency or high blood pressure. Due to the lack of information on the effects of oak during pregnancy and breastfeeding, women going through these stages are advised to consult with their doctor before consuming oak in any form. Oak leaves and bark are not commonly used for uses, but medicinal applications are more popular for treating a number of ailments. Oak should not be consumed orally for more than a month straight. The acorns from oak trees are sometimes roasted and eaten in some regions. Infusion. The bark and leaves of the oak tree can be steeped in hot water to extract their astringent, antimicrobial properties. Oak tea can be taken for treating infections, diarrhea, ulcers, poor digestion, and hemorrhoids. Decoction. The liquid obtained from boiling the oat bark in water, is used for disinfecting wounds, as well as for treating eczema and other skin complains. It is also taken orally for alleviating diarrhea, varicose veins, hemorrhoids, and gastrointestinal infections. When gargled, it can soothe a sore throat and help with gum disease. Powder. The dried and finely ground bark, acorns, and leaves of oak have astringent effects and can be used for sanitizing minor wounds, as well as for treating skin problems, such as acne and eczema. Liquid extract. This glycerine-based preparation needs to be diluted in water before been taken for the treatment of ulcers, diarrhea, and other gastrointestinal complains, as well for relieving varicose veins and hemorrhoids. Tincture. Obtained from alcohol maceration, this concentrated remedy also needs to be diluted in water, and can be taken daily for soothing stomach irritation and ulcers, among other digestive problems. Capsules. In standardized, convenient daily doses, oak capsules, can be taken to improve vascular health, as well as for treating throat infections and inflammation. 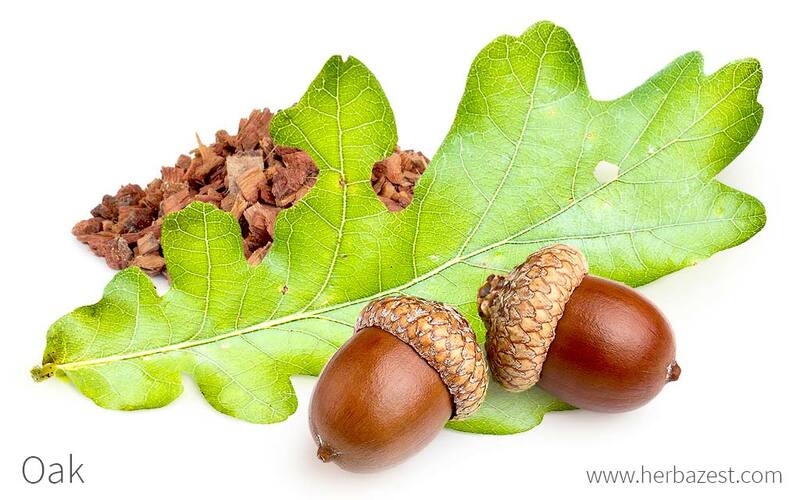 Oak trees and acorns are widely available at nurseries and can also be purchased online. On the other hand, dried oak parts can be obtained in bulk form, tea bags, and powder from specialized herbal stores and internet retailers. Oak remedial forms, like liquid extracts and tinctures, as well as oak capsules, can be be purchased at some specialized herbal stores, however, online retailers stock a wider variety of brands and concentrations. Oak trees are considered fairly low maintenance to grow. However, they need ample space to thrive. In a large garden or field, they will stand out and offer wide shade. Oak trees grow from acorns and need ample space to grow comfortably, given their potential height. These drought-tolerant trees need full sun and well-drained soils, with a pH that can range from alkaline to acidic. Oak trees should be regularly fertilized and watered to be kept in top shape and avoid unnecessary stress on the plant, which will also deter pests like boring insects. Powdery mildew may be a concern in humid areas. Oak trees are deciduous and can grow up to 150 ft (50 m) in height. They have short-stalked, lobed leaves and produce acorns. Oak trees are characterized by their height, large canopies, and broad, round crown. Oaks make great trees for yards that provide ample shade. English Oak trees, or Quercus robur, are members of the Fagaceae family and belong to the Quercus genus, which encompasses approximately 500 species. White Oak (Q. alba), a slow grower that can grow 10-15 feet ( m) in 10 to 12 years and can live several hundred years. Water Oak (Q. nigra), a beautiful ornamental with glossy, green leaves that turn yellow in the fall and persist late into the winter. Pin Oak (Q. palustris), which has a pyramidal shape, with a straight trunk and small, well-attached branches. Its glossy, dark green leaves change to bronze or red in the fall. Willow Oak (Q. phellos), has dark green leaves that are narrow, willow-like and change to yellow-brown in the fall. It produces less acorns than other oak species. California black oak (Q. kelloggii), a common species in California, whose presence stretches as far north as the Umpqua Valley, in Oregon. Oregon white oak (Q. garryana), which is seen all along the Siskiyou Mountains, into eastern Oregon. Canyon live oak (Q. chrysolepis), a species that grows in dry areas of southwestern Oregon and south through California. Other popular species in the genus are southern red oak (Q. falcata), black oak (Q. velutina), Japanese evergreen oak (Q. acuta) and blue Japanese oak (Q. glauca). Since oak trees have been found many different important uses, several cultivars have been developed through selective breeding in order to maximize its qualities. Quercus robur 'Concordia' and 'Purpurea' are usually the ones preferred for ornamental purposes, while the 'Fastigiata' or 'Cypress Oak' cultivar is the most widely used in the timber industry due to its larger size. The English Oak (Q. robur) was first discovered growing wild in a forest in Germany and was propagated by grafting in 1783. Oaks were widely planted in Europe for their appearance and shade and were later brought to North America from England, around the 17th century. THE OAK TREE HAS PLAYED A CENTRAL ROLE IN ENGLISH CULTURE. Oak produces some of the strongest wood, so it is highly valued in the timber industry. Oak wood is also popularly used to make casks for wine and other spirits for storage and flavoring. Oak tree wood takes up to 150 years before it is ready to use. Oak trees have been historically linked to the gods Zeus, Jupiter, and Dagda, who were all gods of thunder and lighting. In ancient Rome, emperors were presented with crowns of oak leaves during victory parades, and the Druids also supposedly worshiped the oak tree, regarding it as sacred. In English culture, a spray of oak was engraved on one side of sixpences and shillings, and the yule log was traditionally cut from oak. The English Oak is also referred to as the Sherwood forest tree, and legend has it Robin Hood used to hide in the hollowed trunk of an English Oak that is still standing today in the Sherwood forest. Landscaping. Because they provide ample shade and have an impressive appearance when mature, oak trees are often used in landscape design. Environmental support. Oak trees provide habitat for wild animals, and their acorns are an important food source for game species, such as deer, turkeys, and squirrels. They also help prevent long-term soil erosion. Timber. Oak timber is widely used to make architectural beams, furniture, and casks for wine and spirits. Traditionally, oak was used for shipbuilding and tanning leather because of its strength and high tannin content. Flavoring. Oak saplings or leaves are rarely eaten directly, but oak wood is sometimes used for smoking fish and meats because of its unique aroma and flavor.